At Anthony Spink Dental Suite, we offer a broad array of dental services to meet your entire family’s needs. From providing general checkups to more complex work, our experienced team will take great care of you from the moment you step into our clinic. If you’re missing teeth, we provide full and partial dentures to restore your smile. In years past, dentures may have been thought of as uncomfortable, loose or inconvenient. Today’s dentures, however, fit seamlessly into your mouth and are easy to maintain with your regular checkups at our practice. Your dentures can be created from a variety of materials to suit your particular situation and your budget. If you need to replace all your teeth, full arch dentures would likely be your best option. They’re the dentures that most people think of, encompassing the replacement of every one of your teeth. Your dentures can be crafted to the tooth shape and colour that you desire for a gorgeous, natural look. We’ll take the necessary impressions, then have your dentures created in our laboratory. Once completed, you’ll return to our clinic to ensure that they fit properly. We’ll detail how to care for your dentures and what to do if you require repairs or readjustments. 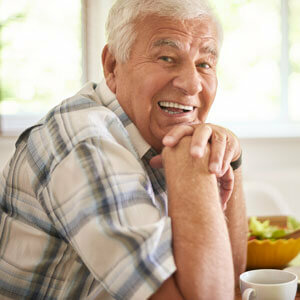 Partial dentures can replace one or multiple missing teeth. If you still have some of your natural teeth, these dentures may be the most suitable solution. We take a conservative approach to dentistry that preserves your existing teeth whenever possible. Once we determine that partial dentures are ideal for you, we’ll gather the necessary information. This data is then sent to our laboratory, where your partial denture is created to your specifications and needs. A fitting will be done in the clinic to ensure your comfort and satisfaction with your denture. A dental implant is the most revolutionary solution in today’s dentistry to replace missing teeth. It involves a titanium implant surgically implanted into the jawbone. Your jaw accepts this “post” as a natural tooth, building bone around it as the site heals. When the healing is complete, we can place the denture on the implants. Dental implants can provide dentures the support they require to feel secure with a perfect fit in your mouth. Usually, two or four dental implants are placed depending on your situation. We’ll be able to advise you on what is best for your case at your initial consultation with us. We accept all health funds, and you can claim your rebate on the spot with our HICAPS machine. We are preferred providers for HCF, Medibank and MDF. If you do not have dental cover for dentures Brighton, we work with zipMoney to bring you affordable payment plans. Contact our team today to schedule your appointment! We’ll sit down with you and have a consultation about which denture option might be most appropriate for you. We provide convenient opening hours that fit easily into your busy week.